In March I had the honour of experiencing my first red carpet at the prestigious Princes Trust Celebrate Success Awards. Founded in 1976 by HRH Prince of Wales, The Princes Trust are a youth charity who help young people that are unemployed or struggling in education to get their lives back on track and achieve their potential by developing their self esteem and skills required for the workplace. Every year, the Princes Trust honour the achievements of the young people who have been supported by one of the Trust’s programmes, with the National Celebrate Success Awards. Last Autumn, there were 11 Oscars-style regional awards, of which I was delighted to attend the one at The Sage in Newcastle, from which a short list was drawn for the finals that I went to at the prestigious London Palladium. The dress code was business smart which immediately threw me as when I think of a red carpet event, I automatically think of more of an evening dress. However after a quick dash through to the Metrocentre, I picked out my outfit for the occasion; a Yours Clothing Black Crepe Longline Waterfall Jacket with a jewelled brooch from personal shopper, Cocorichelle1, worn over the Evans Longline Pocket Dress which is available in a round neck or the split that I have. As I’m sure you’ll be aware, I love mixing high end and highstreet pieces together and a great example of this is the Dune Briela Shoes that look so much like Manolo Blahniks, worn with my Primark pearl effect bracelets, River Island earrings and my Chanel WOC that I tend to used when I don’t need to carry too much with me! The morning of the Celebrate Success Awards went by in a bit of a whirlwind and while I may have tweeted a couple of outfit photos, behind the scenes I was in far more of a rush to head out of the door than I had anticipated. When the opportunity arose, I headed to The Alnwick Garden up in Northumberland to recreate my outfit. 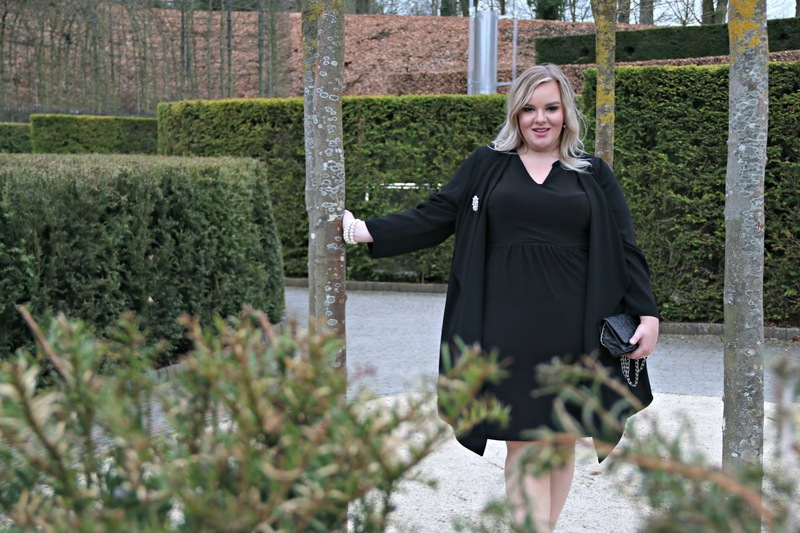 Their perfectly preened Serpent Garden was the perfect backdrop for this outfit and when the hidden water features come to life both here and at the bottom of the Grand Cascade, the true beauty of Alnwick Gardens appear even more magical. It takes a lot of hard work and dedication to create and maintain the stunning gardens which are qualities that The Princes Trust encourage in those they help. Through hearing the stories of the young people at the awards, it is evident that such a positive mindset and productive behaviour has been encouraged and achieved. Many Celebrity Ambassadors were in attendance from North East legends Ant and Dec to Philip Schofield and my Silent Witness girl crush Emilia Fox who wore the most incredible bright pink heels, as well as many dedicated volunteers and staff, bloggers, sponsors and of course, HRH The Prince of Wales himself. It was amazing to be in the presence of the Royal Guards Fanfare and to sing the National Anthem which really brought home just how much of a momentous occasion this was. We were treated to performances by X Factor winner Matt Terry and the fantastic cast of School of Rock, the musical. Each of the sponsor’s representatives and the Trust’s Celebrity Ambassadors who presented an award ,spoke candidly about their connection with the Trust, the work that the Princes Trust do and how they have been inspired by the young people that have been helped. Professional Footballer, Thierry Henry in particular gave a very humble and thoughtful speech that really impressed me. However it was Prince Charles’ sincerity, appreciation, thought provoking words and witty charm at the end of the proceedings that really struck a chord with me. He spoke with reference to Efaz, who had turned his life around and won the Mappin & Webb Young Ambassador of the Year Award, and his joy at hearing him refer to the The Princes Trust as being a family. When Princes Charles set out in creating the Trust, he aimed for it to be a virtuous circle with one sequence of events benefiting the next. It was great to hear how this has been achieved, especially with the example of Elizabeth Galton who is the Creative Director of Mappin & Webb, who sponsored one of the awards. She got started in her career thanks to a travel bursary from the Princes Trust some twenty years ago! Above all, it goes without saying that the most important people who were at Celebrate Success, and those who had the biggest impact on myself, were the young people who had been helped by the Princes Trust. The Princes Trust help transform the lives of 13 to 30 year olds that are out of work or struggling to progress at school. They provide expert advice, courses and life skills as well as support and guidance to get them into jobs, education and training. To date, The Princes Trust have helped over 870,000 young people, almost 60,000 a year. Many of them are from disadvantaged backgrounds, unstable homes or the care system and many are in vulnerable position, facing the prospect of homelessness, suffering with mental health issues, have been in trouble with the law or are at risk of offending. Its a sad fact that despite living in such a developed, privileged country, not everyone in the UK has an equal start in life. I think its really amazing that the Princes Trust are there to help as many of those people as they can by giving them the practical and financial support that they need to stabilise their lives, gain independence and give themselves the best chance at a brighter future. This not only impacts them positively but their family and community too. I have experience of this as The Princes Trust helped someone close to me which has directly benefited not only their life but mine too. To me, one of the greatest things about The Princes Trust is the confidence and increased self esteem that they encourage in those who they help. Belief in ones self is an incredibly valuable asset when entering education, training and work because when the going gets tough, it encourages you to keep moving forward. The Princes Trust are currently working at a fantastic 78% positive result from all of their efforts and I’m sure if even more people heard the success stories of those involved with the Trust, even more young people would be motivated and encouraged to get on board. You can read more about how the Princes Trust providehelp for young people here. Hearing some of the Celebrate Success stories of those who have overcome so many personal struggles and challenges in life to get to where they are today, having taken part in one of the Trust’s programmes, was incredibly inspiring. I’ve felt motivated to support The Princes Trust for a long time but my experience at the awards ceremony certainly made me feel keen to get the word out to those who they could help. I felt incredibly proud to be a part of The Princes Trust as I’m sure you’ll have gathered by my tweets, live from the London Palladium on the day! The whole occasion was a very overwhelming experience to say the least, particularly being in the presence of royalty and amongst so many incredibly inspiring young people; a day that I will never forget. Find out more about The Princes Trust for yourself here and the many ways that you can support them here. What do you know about The Princes Trust? How have you been inspired by their work? What do you think of my outfit; does it meet the business smart dress code? Next Post Charlotte Tilbury Makeup Launches at Feel Unique! What wonderful work The Princes Trust is doing and what an honor to be able to attend one of the success awards. It must have been such an inspiring and heartwarming evening. What a great cause to celebrate. I love your outfit especially the shoes and handbag. The Princes Trust do amazing work, I love your outfit, you look fab! I didn't know the existence of the Princess Trust until reading your article. It's wonderful what they are doing for disadvantaged children and how many of them they managed to help each year! What an incredible event to attend. The PT do fantastic work for so many young people. You look absolutely stunning in this outfit. I love those shoes! You look amazing! Very glamorous, I love the pearls. What an amazing charity to support! You look beautiful – love those shoes! You look so gorgeous! What a memorable event to attend, incredible how many people they have helped! What beautiful and classic photos! You look so glamorous and chic my lovely! The Princes Trust is such a great charity, the work they do can really change lives. Glad to hear you had such a good time at the event, you looked fab. Oh you look beautiful! It sounds like such a brilliant event.